The Governor of Ekiti State, Dr. Kayode Fayemi, Monday expressed anger and disappointment in his predecessor, Mr Ayodele Fayose, over the alleged abandonment of the Ikogosi Resort Centre under his watch. Fayemi described the abandonment of the tourist centre he branded as a major attraction in the country, as a flagrant and brazen â€˜destruction of Ekitiâ€™s heritageâ€™. The governor spoke in Ikogosi Ekiti in Ekiti West Local Government during the inspection of the facilities at the Ikogosi Warm Spring, which was a confluence of warm and cold spring. Fayemi also visited the Arinta Waterfall site in Ipole Iloro, with the intention to build Ekitiâ€™s tourism potential to boost the internally generated revenue (IGR) of the state. The governor said it was wrong for the immediate past government to have abandoned the warm spring site and run Gossy water being produced from the spring off the market under the guise that the project was midwived by the preceding government. Fayemi said: â€œI want to express my anger with what I have seen here today. I am really upset. You all witnessed the spate of development here in 2014, you knew the patronage this facility was enjoying. â€œWhat I met here today means to me a destruction of Ekitiâ€™s heritage, destruction of our commonwealth. It was unfortunate that our government had become so careless to allow this major tourist attraction and revenue earners for Ekiti to destroy and decay. everything. Now, everything is in shambles. 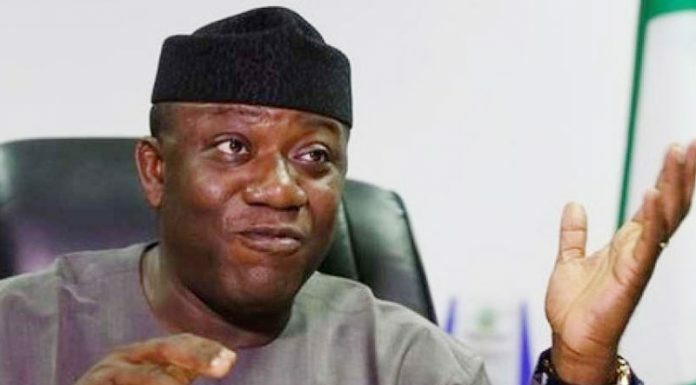 Fayemi said that the Gossy water project, owned by the United Africa Company (UAC) that had left the market due to governmentâ€™s unfavourable disposition would be brought back. â€œGossy water is associated with Ekiti, it is a brand that was known to belong and part of Ekiti. Wherever you see the water, you will think of Ikogosi Warm Spring, so we are going to bring it back to life. â€œApart from the fact that the facilities in this resort had been damaged, the roads to this place are impassable, particularly the Aramoko- Erinjiyan-Ikogosi road. â€œHalf of the 110 rooms in this resort are not habitable, this is unacceptable to us. â€œThis is not what Ekiti was known for, this is not what we are, because we are used to managing the little we have. development we brought here before we left in 2014 and not to allow it to damage. â€œI canâ€™t because of politics cancel the Gifted Academy in Afao Ekiti, I canâ€™t demolish the flyover and the new Governorâ€™s Office built by the past administration, I can only improve on them and that is what governance is all about. â€œThe projects of this state belong to the generality of Ekiti people and not to the governors and every government must neither abandon them nor allow them to be destroyed just because they are not the initiators,â€ he said. Ekiti state is a state with confused and senseless people. You're the governor now. Why don't you just do what needs to be done?